How about 750,000 new apps for your Surface Pro? Windows 8 users, especially those with a Surface Pro, can now enjoy up to 750,000 new apps for their devices, with Bluestacks launching a new beta version of its Android app player. Advertised as "optimised for Surface Pro, the latest version of Bluestacks joins builds for previous versions of Windows and a version for Macs. The Android App player is sort of like an emulator that lets you run any Android app on devices which are not powered by the Android OS. 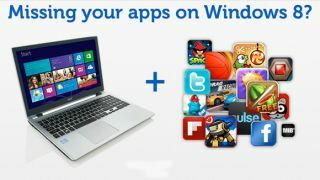 Bluestacks handles the code and the user interface for the apps. The company recently announced 5 million downloads of its beta software, even before it launched for the touch-friendly Windows 8 environment. There are plenty of punters queueing up for news about the tool's development too, with the company's Facebook page acquiring over a million followers,. Despite there being a lot of enthusiasm for the project, the software is receiving mixed reviewers from everyday users. Tech site CNET awarded Bluestacks a 'best of CES award' in 2012, but comments on the CNET download page from users are far less favourable; many pointing to a laggy experience within apps. "There's probably not enough space on the internet to list everything wrong with this program, so here's the condensed version: its a disaster," bemoaned one dissatisfied user. Still, that is what beta test periods are for: downloading with an open mind and crossing your fingers for performance enhancing updates. We have confidence that these bugs will be sorted before Bluestacks is ready for prime-time.